My husband works long hours. We have four children with various activities. We do not always have time to connect with each other in between. So how DO we stay connected with there just is not time to connect? Well, it’s not with a monthly date night, because even that can’t be scheduled around his work hours and the family obligations. It’s not with big getaways for just the two of us, because with four kids, that isn’t possible either. 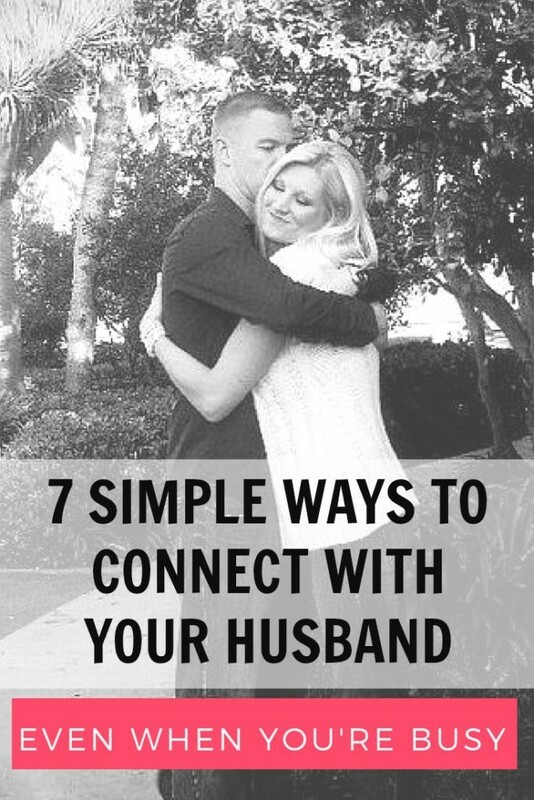 No, there are 7 simple ways to connect, that don’t take a lot of time or effort even, and make a world of a difference in our marriage. 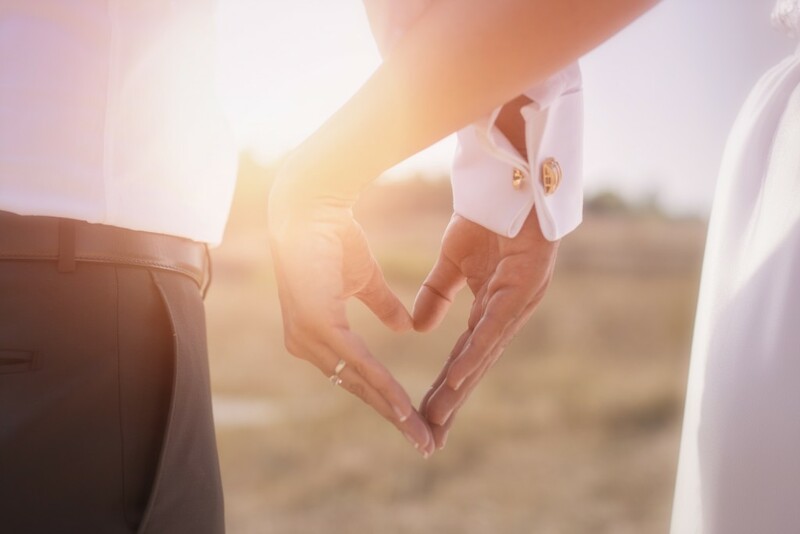 When a family grows and life becomes increasingly more demanding, it is so often that husband and wife begin to drift apart. After all, the honeymoon is over, this is real life now. It is so easy to focus all of your attention on work, on the kids, on the house, on the finances – all of the things that *need* to get done. But a healthy marriage needs attention too. In between all of that, you have to find a way to stay connected to the man that helped you create this life, if when you’re busy. Even when my husband leaves in the very early morning hours, he will always come to me, still sleeping, and kiss my forehead before he heads out. It is one of my favorite connections of the entire day. That simple gesture says I love you, I am thinking of you, and stays with me until he comes home in the evening. Amidst children running at him and the dog jumping as he walks through the door, I stop him. We hug. We connect. Just two minutes to slow everything down and be together. NO, I’m not talking about that! – I’m talking about actually going to bed at the same time. My husband wakes up very early most mornings so I adjust my schedule to go along with his, that way we shut down the house and go to bed together. The nights we do not, it’s just lonely, even if he or I are just in the other room. There is something about lying down next to each other and saying goodnight. Keeping yourselves on the same schedule will also make it more likely that you have moments throughout the day to connect. We often do this for our children, in their lunches at school, so why not do this for our husbands too? Occasionally I will add a note to my husbands lunch, leave one in his car, or slip one in his pocket when he’s not aware. Just a little something to say “I love you, and I’m thinking about you”. No paper necessary! Every so often my phone will ding and I’ll check my message to find a quick “LOVE YOU!” or something similar, from my husband. It’s his way of leaving me a note to say I’m on his mind. Nothing can turn a bad day around or put a smile on my face faster than that! Any small amount of contact will rejuvenate your connection. Sit together on the couch. Hold his hand while you watch your kids play. Just be near him. We spend so much time apart running from work to school, taking care of the kids, you forget what it means to be near each other. Take the time to make contact. Even when you’ve been married for 10 yrs, for 20 yrs, you cannot just go on assuming the other person knows you love them. It only takes a moment to speak the words and it might be exactly what your spouse was needing to hear. Do you have other ways you connect with your husband during the busy week? I’d love to hear about them! That is a sweet photo of you and your husband! It really is simple to implement these tips and at some point we all need to become mindful of staying connected. I love your blog or page!